Developer Pulse Code has released Modular Synthesizer, an analogue-emulating synth app for iOS based around - shockingly enough - a modular design. The app is free to download and comes with enough modules to build and edit sounds. Additional modules are available to buy as in-app purchases, either individually or as a complete bundle priced £2.99/$4.99. According to Pulse Code, "Modular looks, acts, and sounds like a hardware modular synthesizer to give you features that musicians want such as pulse width modulation, oscillator sync, 4 pole ladder filters, and 1v/oct filter tracking. Traditional modular systems are expensive and out of reach for the average artist. Modular is here to bridge that gap and allow everyone the opportunity to use these powerful synthesizers." 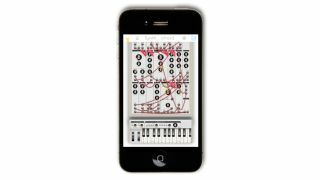 The app, which runs on iPhone, iPad or iPod touch, features a great looking interface, complete with virtual patch cables, keyboard and pitch and mod wheels. Modular Synthesizer is Audiobus and Core MIDI compatible and can export recordings to via SoundCloud, AudioCopy, email or iTunes.